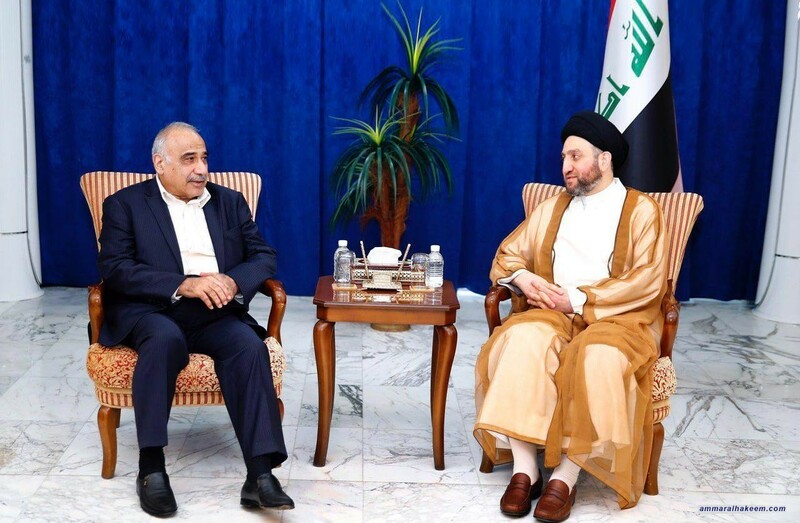 Head head of the Reform and Reconstruction Alliance, Sayyid Ammar al-Hakim, in his office in Baghdad, received Prime Minister, Mr. Adel Abdul-Mahdi. His eminence with Abdul-Mahdi discussed the latest political situation, completing the government cabinet, and implementating the governmental program. His eminence stressed the need for qualified ministers characterized by integrity, competence and management capacity, called put services as priority at the present time along with focus on security and generating positivity. His eminence also called to sustain communication between the government and the Council of Representatives and to find a state of harmony to complete the construction process, which needs parliamentary legislation and governmental implementation, stressed on the importance of excluding Iraq from regional disputes and international axes. Mr. Adel Abdul-Mahdi congratulated his eminence for being elected head of the Reform and Reconstruction Alliance, sand wished him all the succeed in his mission to serve Iraq and its people.